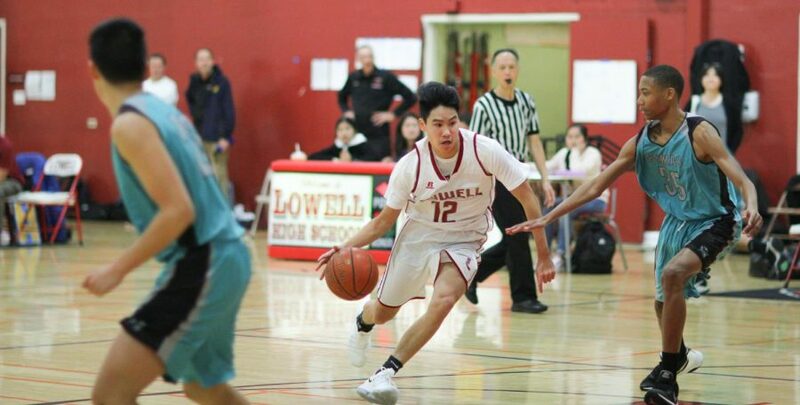 Sophomore forward Derek Quach fiercely dribbles down the court during the game against the Burton Pumas on Jan. 14 at home. The JV boys basketball team defeated the Burton Pumas 47-28 on Jan. 14 at home. With an undefeated record of four wins, the team is currently ranked first in the AAA/CIF San Francisco section. The first quarter started off with the Cardinals falling behind 9-0. Through head coach Curtis Chan’s motivation to the team during a timeout, the Cards regained their confidence. Soon, Freshman guard Noa Abuan Andaya scored the Cardinals’ first point of the quarter, setting the score at 9-2 shortly before the first quarter came to an end. As the second quarter started, the Cardinals began catching up to the Pumas. 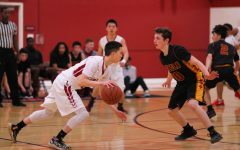 Sophomore guard and forward Tully Chan and Derek Quach scored the team’s second and third baskets of the game. 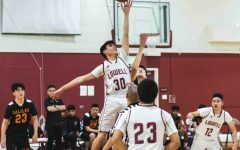 Encouraged by their successes, the Cardinals began getting into the momentum of the game and scored consecutive three-pointers. The score was soon boosted to 18-13. Maintaining a strong defense of their court, the Cards ended the quarter with a close score of 18-17. 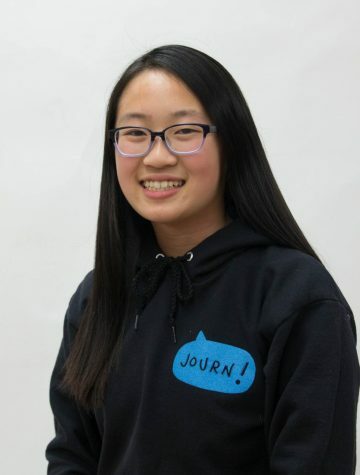 Immediately after the start of the third quarter, Chan scored a two-pointer, placing the Cardinals ahead of the Pumas for the first time in the game. 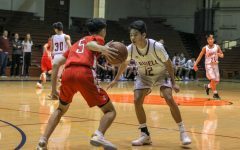 With multiple three-pointers, two-pointers and free throws from Chan, Abuan Andaya and a few others, the Cardinals dominated the third quarter with a score of 33-22. In the last minute of the fourth quarter, freshman guard Jonathan Takeda made the last basket of the game. This three-pointer set the Cards off to a victory of 47-28. 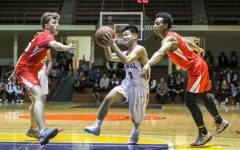 Sophomore guard Tully Chan aims his shot under the Pumas’ distraction. Chan was satisfied with the results of the game but he also saw areas for improvement. “I feel like we were sleepwalking a lot in the first quarter,” he said. Despite this, he thinks the team was able to demonstrate their abilities by the end of the game. 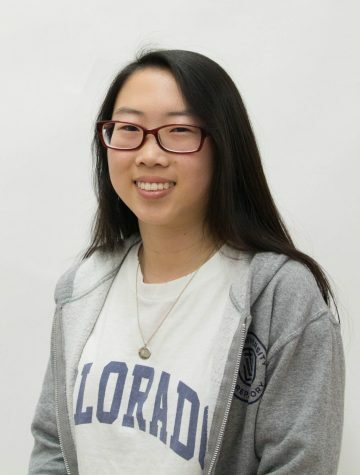 “The guys were pretty tough and they responded to a poor start,” Chan said. The Cardinals’ next game is against the Lincoln Mustangs at 4 p.m. on Friday, Jan. 25 at Lincoln High School.